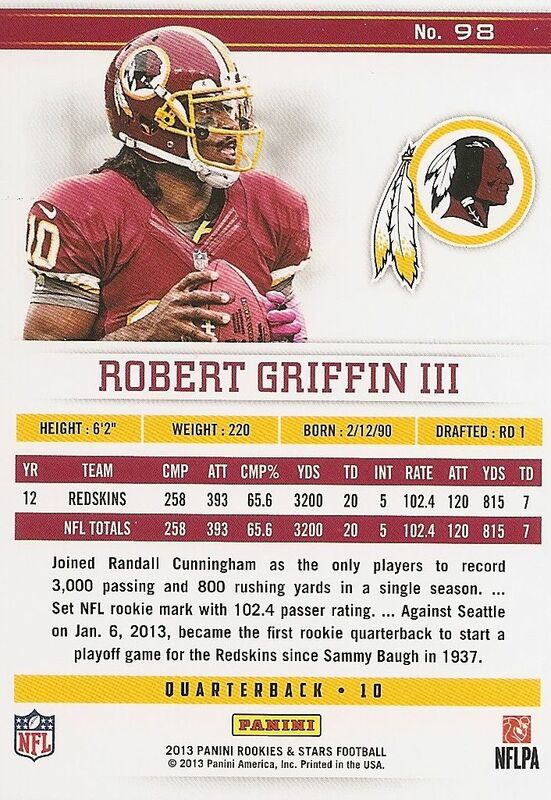 2013 Rookies & Stars Football is a product that just about any football card collector can afford to get into. This mid-lower-end product, despite its relatively minimal pricing at around $4 per pack, has a very nice (and good looking) selection of autographed and memorabilia embedded cards to pull. Mixed with the hits are a bevy of insert cards focused on, you guessed it, the NFL's best rookies and stars! The 2013 Rookies & Stars base design is very different than many of Panini's recent products. Many recent Panini offerings make use of the color white to give cards a clean, modern look. For example, Score has white borders, and the just reviewed Momentum has an almost completely white background. Rookies & Stars makes a complete departure in terms of what I would expect from a Panini design. So does it work? For me, the effort falls right in the middle. I applaud the choice to come up with a different looking card, but the design seems a bit dated to me. It actually reminds me of something Skybox would have put out in the 90's. The most distracting part of the card has to be the huge player last name on the left-side of the card. Can that get any bigger? The back is much more familiar in terms of design. Look! It's a white background! The back is laid out in a very clean and systematic way. Including a full-color photo was a nice touch, as well as the team color bars. This is about the design I'd expect on the back of a Panini card at this price point. It has some frills, but as a whole, it's pretty standard fare. 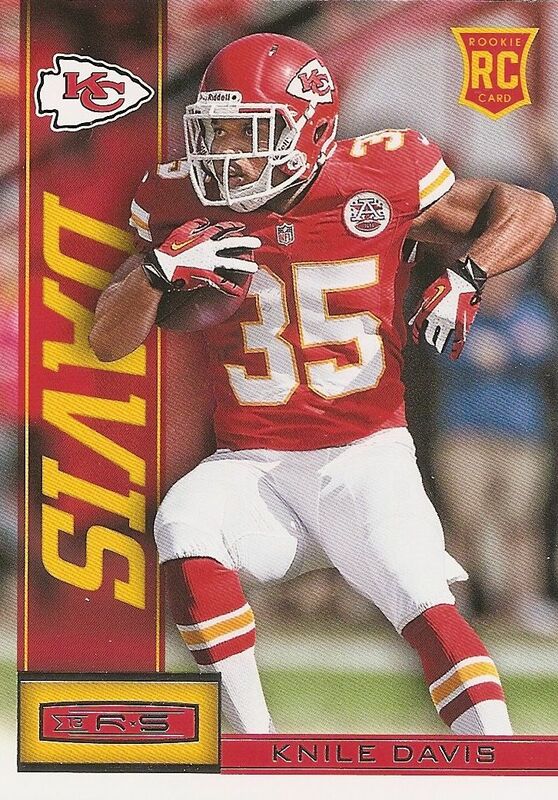 Rookie cards come in the the exact same design as the regular base cards save for a rookie logo located on the upper corner of the card. 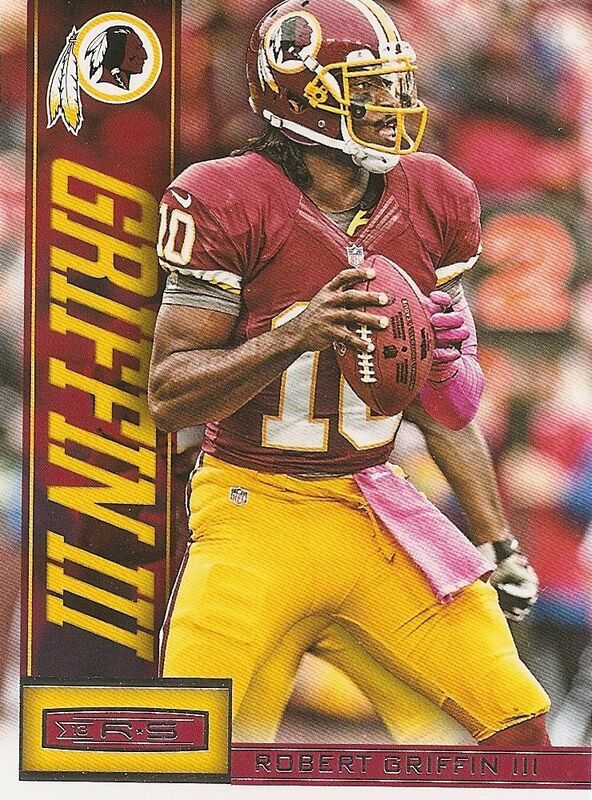 The regular base cards and rookie cards have many parallel variations within Rookies & Stars. They will be mentioned later on with the rest of the inserts and special cards within the set. Just about every pack of Rookies & Stars will land you something for picking it out - it could be a regular insert card, a parallel card, a memorabilia card, or an autograph. I enjoy that fact that there are so many insert cards in Rookies & Stars. It's a great mix of inserts you may have found during the insert-crazed years as well as the hits you'd expect in modern cad products. 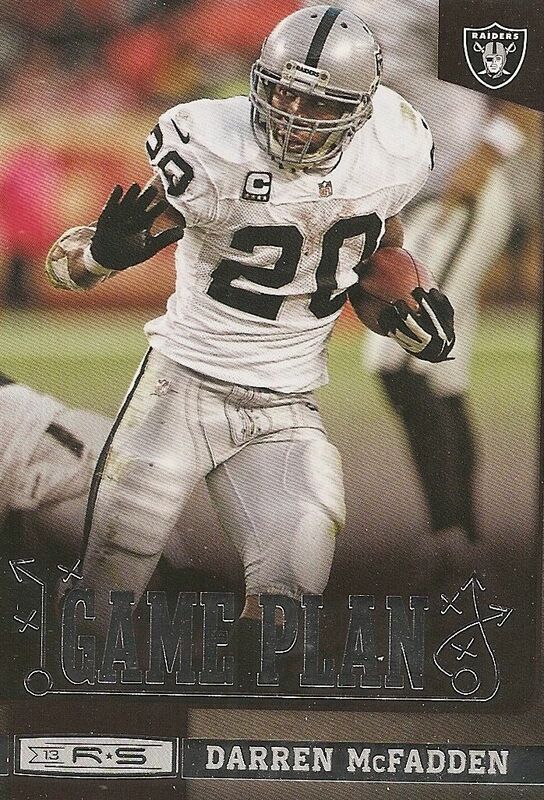 I'll start with some of the regular inserts like this Game Plan Darren McFadden. Game Plan cards come on standard card stock with a generous amount of foil used in the pretty cool looking Game Plan logo. The game plan cards will undoubtedly not hold high monetary values, but that's not the point of these cards. These cards are great fun to look at and read, especially for a younger collector. If a young (or older too) collector were to pull this card, they would learn that the Raiders used him not only to run the ball, but also had him catching a fair amount in their game plans last year. Now that's good stuff! The Touchdown Club is all about players who get the TD's for their teams. 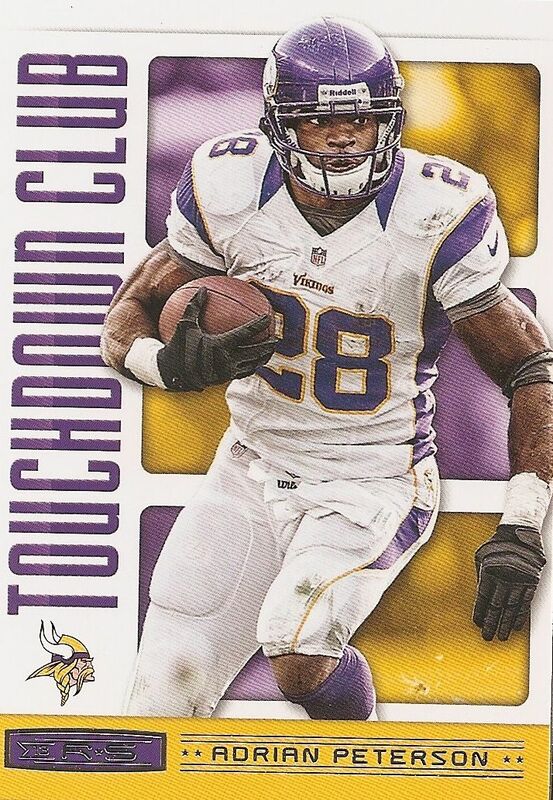 Obviously Adrian Peterson was a massive force for the Vikings last year, so he gets a card for himself. These types of inserts, besides being fun to read, are also great for player collectors adding variety to their collections. It's not always about the serial numbered card numbered to less than five... these too are important parts to add for player collectors. 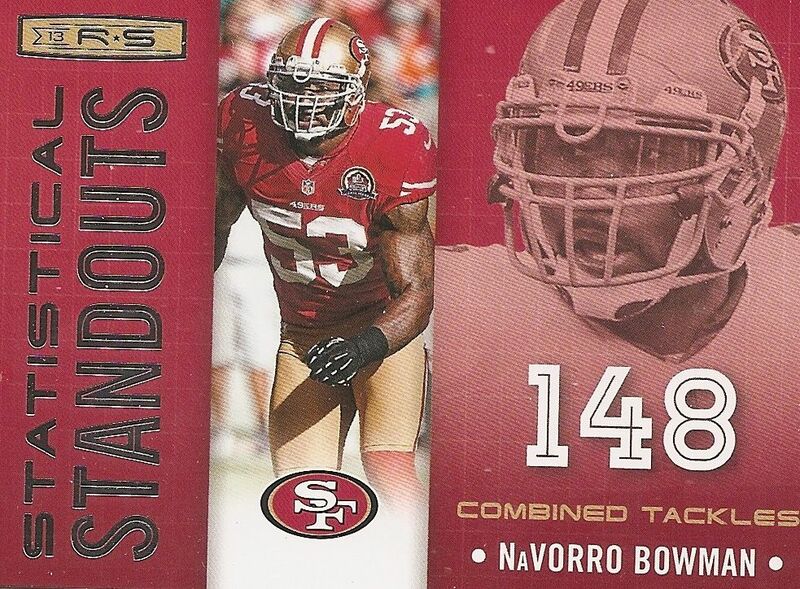 For you numbers guys out there, the Statistical Standouts insert set is for you! Panini has chosen players who really stood out last season in certain categories and put them in this set. The design of these cards celebrates their achievement by making their statistical number large for collectors to see. My one small gripe about these cards is that the front and back orientations don't match. The fronts are horizontal while backs are vertical. That's a bit disorienting! Check out these super-shiny cards! These eye-catching cards are part of the Crusade insert. Panini has done a full-release of these cards in basketball, but they show up here as an insert card. The crusade cards are on thick foil board stock and have a great shimmer to them. Detailed etching of the various patterns and pictures in the background are top notch. 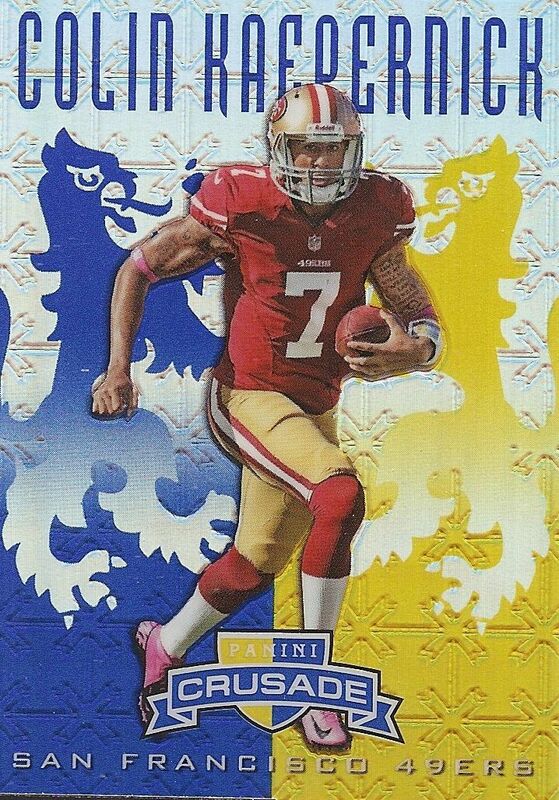 Collectors can find these regular Crusade cards as well as serial numbered parallels in different colors when they pick up Rookies & Stars this year. Speaking of parallel cards, many of the card in the product have multiple variations and numbering. 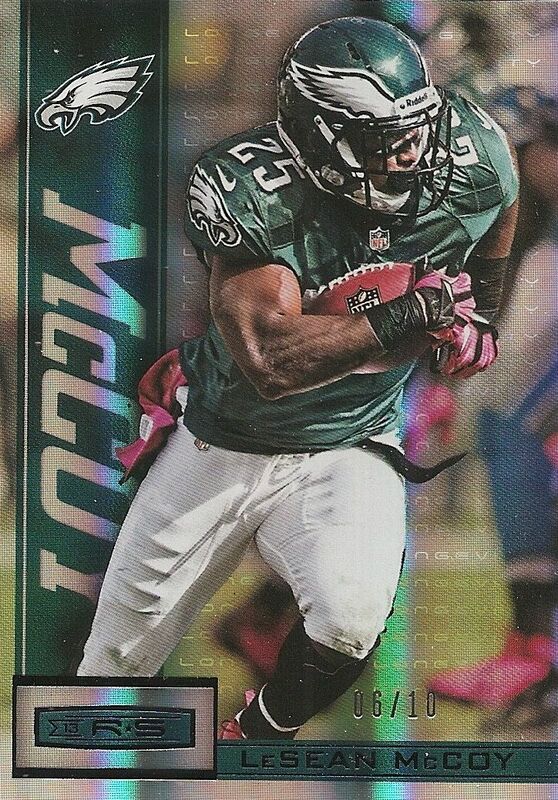 I was lucky enough to pull this LeSean McCoy parallel numbered to only 10 in my box. These Longevity parallels have been a pretty standard part of the Rookies & Stars set, so collectors probably expect to see them when they open their boxes. The parallel cards get a very thin foil treatment that increases the way the card looks by a factor of 10. The foil on these cards is just done so well, I have to give it to Panini for their foiling process. 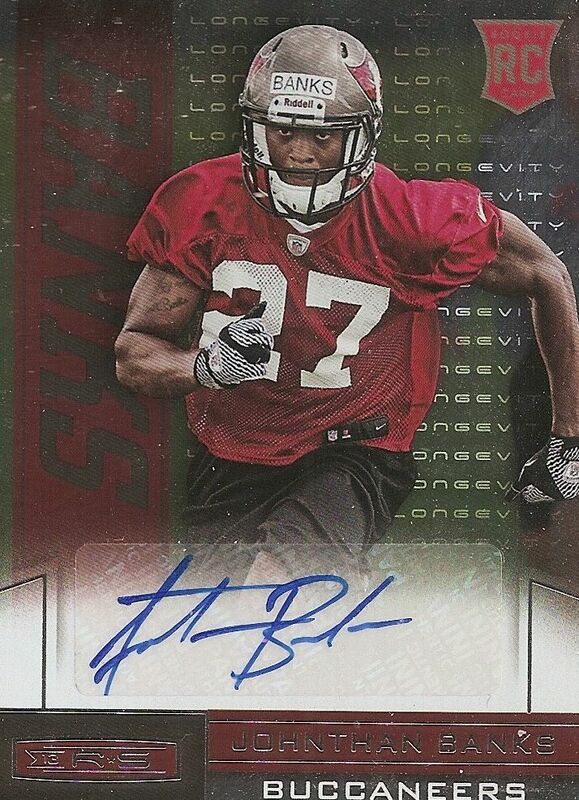 Here's a rookie parallel card of Johnthan Bankss. It's an unnumbered foil rookie autograph parallel. Though it's a sticker autograph, I appreciate that the card has been tailored to fit the sticker by creating a designated area for it. In past Panini products, stickers would just be stuck to base cards with no regard. I hope that practice with Panini is done forever. 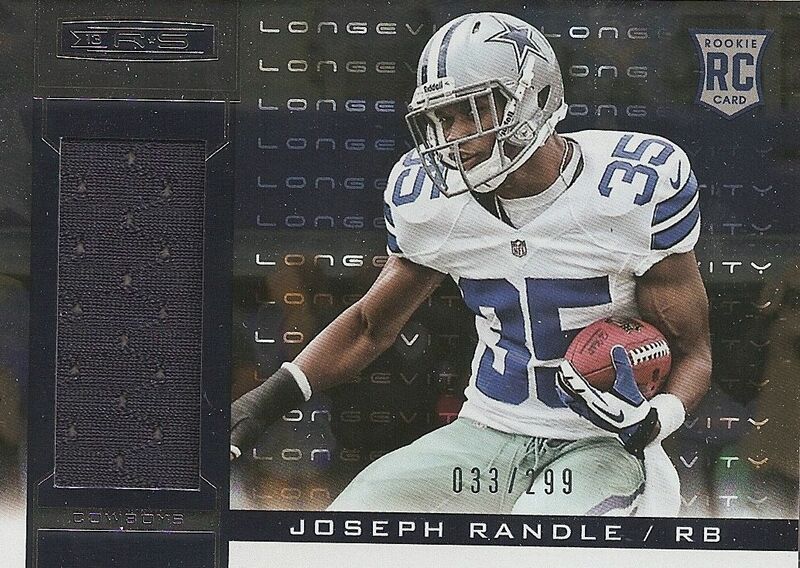 Here's a jersey rookie card of Joseph Randle. I've mentioned this in the past, but I'll bring it up again. Combining foil cards with memorabilia is very cool! I've got to say that the word that comes to mind when seeing this card is 'slick'. It has numbering, a jersey piece, and foil. The elements come together perfectly. 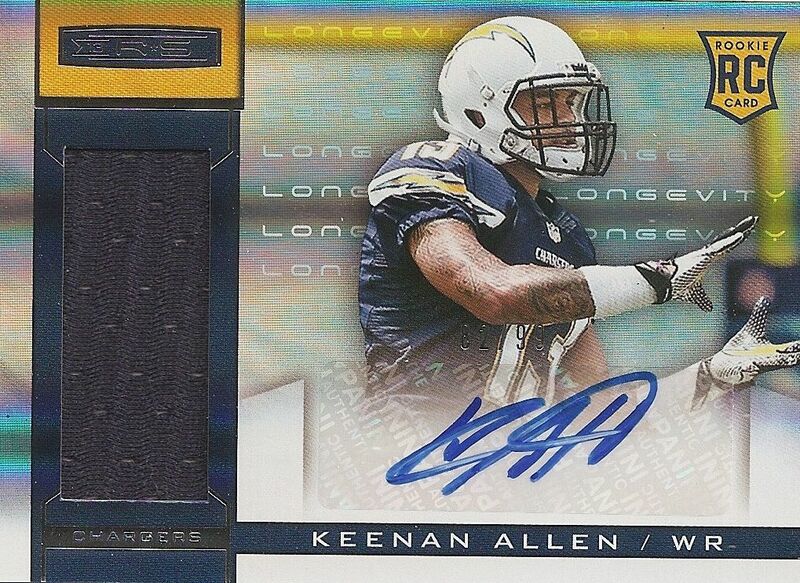 Similar to the Randle, this Keenan Allen card has been done very well. It steps it up a notch even more by including an autograph of Allen and with lower serial numbering. Though the cards look amazing, I can see that it would be very difficult and potentially confusing to track all these cards down. 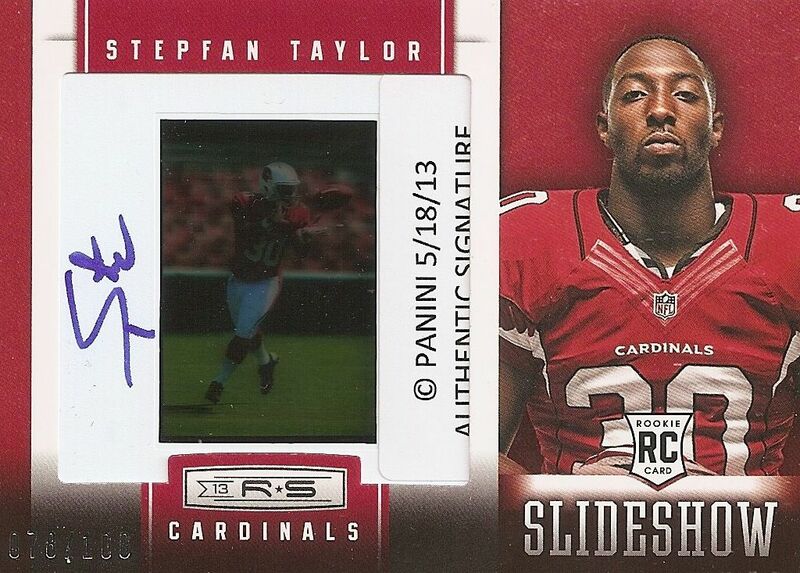 My final hit from this box was this Slideshow card of Stepfan Taylor. Companies rarely use film cels much these days (they did in Momentum, actually)... but it's nice to see this unique practice coming back. The film cel appears to have been taken on 5/18/13 according to the embedded cel. That's awesome! I love how different this hit is from the standard hit.Taylor has signed the card and it has been limited to only 100. As you can see by my box, there is a ton of things to find in Rookies & Stars this year. Besides what you've seen from this box, collectors can look to find patch cards, dual autographs, and even 1/1 printing plates. I'd say Panini did well to include so much here! With a price of well-under $100 per box, Rookies & Stars delivers tremendous value and variety. So many of the cards feature serial numbering and jerseys or autos. This is definitely a good buy for the amount of stuff you can pull. Panini has gotten the details of 2013 Rookies & Stars right. They have made the cards look great, and they have introduced interesting concepts into their subsets. My only small gripe with the set is the standard base card design, but that's just a small thing. 2013 Rookies & Stars is a great effort and a very good buy. I definitely recommend a Rookies & Stars box to all football card collectors. With 24 packs per, you're going to have a really fun time looking at the cards that come within. I find this product full of great inserts card designs but you always see rookies getting pulled with mem and autos and never really stars like AP. But just my opinion if you can get a good deal on the box, it's way worth your value. I'm not a huge football fan but the hits and the inserts are pretty cool I'd say! I think Panini did a great job with this product. For a price around 80-85 dolars it is well worth it. I even think about buying a box. Your box was very cool especially that Allen, Mccoy and Taylor. I think panini really stepped it up this year with r&s. They kept the one rookie per pack concept but upped the quality of their hits. The /10 was also a cool hit. Don't really like the base cards though. Wow the autos look amazing!!! Great review, if I were to ever get into football if get this box. I really like this product the crusade inserts are just like from basketball. The inserts in this product are awesome. Don't like again how most of the hits are going to be rookies like prestige, ect. Not the biggest fan of american football but still cards look pretty good! Fun product with good value. I think the photography and detail in this years product is nice as well. Thanks for the review! Normally I get very picky when boxes and products have far too many inserts but this time I just don't have a reason to be picky. Every insert looks so different its awesome. Most time they all look the same or very close. Great product with a large variety of hits. The autos are gorgeous and the Jersey cards are slick. For me European Football is number one but Panini always makes great boxes, The photographs on this product is great and good to us viewers you show other sports for review! Thanks as always for great reviews! Really nice product, looks great! the cards are really cool.